Profiles nine American soldiers of fortune in twentieth century conflicts around the world, from Israel to Africa. Merc is a classic; first published in 1979, its characters and stories are as vivid and worthy of retelling today. American soldiers of fortune have seen action on nearly every battlefield in history – from the Revolutionary War to modern times, men like John Early, a member of the famed Selous Scouts who hunted terrorists in Rhodesia. They fight because they enjoy combat, for causes in which they passionately believe, for money, or simply for adventure. The mercs profiled in this book range from West Point graduates and Harvard poets to former CIA agents and ex-cons. They are men like William Morgan, a guerrilla leader in the Cuban uprising against Fulgencio Batista, later imprisoned and executed by Fidel Castro; David Marcus, raised in New York’s Hell’s Kitchen, who went on to a brilliant career in law and reform politics and died in 1947 fighting for the survival of a tiny new nation called Israel; William Brooks, Vietnam Special Forces veteran who, down and out in a cheap Paris hotel, joined the French Foreign Legion and ended up in a remote African outpost where he lived on Coke, salt tablets and paregoric while fighting Somali insurgents; and George Bacon, an ex-CIA operative in Laos with mysterious connections, who died fighting Cubans in Angola. 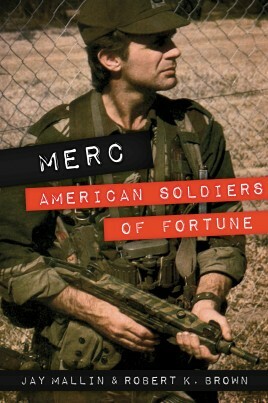 Because their private histories parallel the larger history of unconventional warfare and political upheaval, Merc: American Soldiers of Fortune provides insight into global conflicts, but most of all it is a fast-paced, eye-opening account of a little-known but fascinating way of life. Robert K. Brown, former Green Beret, is the legendary founder of Soldier of Fortune, a magazine like no other, which became an icon for action-seekers in the U.S. and around the world. After a bizarre military career that succeeded in getting him kicked out of Special Forces not once but twice and being wounded in Vietnam, he accompanied teams to work and fight with the Rhodesians. the Afghans during the Afghan-Russo war, Christian Phalange in Lebanon. ethnic minority Karens in Burma. the ethnic tribes fighting the Communist government of Laos. the army of El Salvador. and the armed forces of struggling Croatia. Brown sent medical teams, often into the jaws of danger, to Burma, Guatemala, the Dominican Republic, Afghanistan, Bosnia, El Salvador and Nicaragua, and also into Peru after a devastating earthquake.